It's not too late to register to take part in the conversations on how Public Policy and government regulations will affect bike-sharing for 2014. 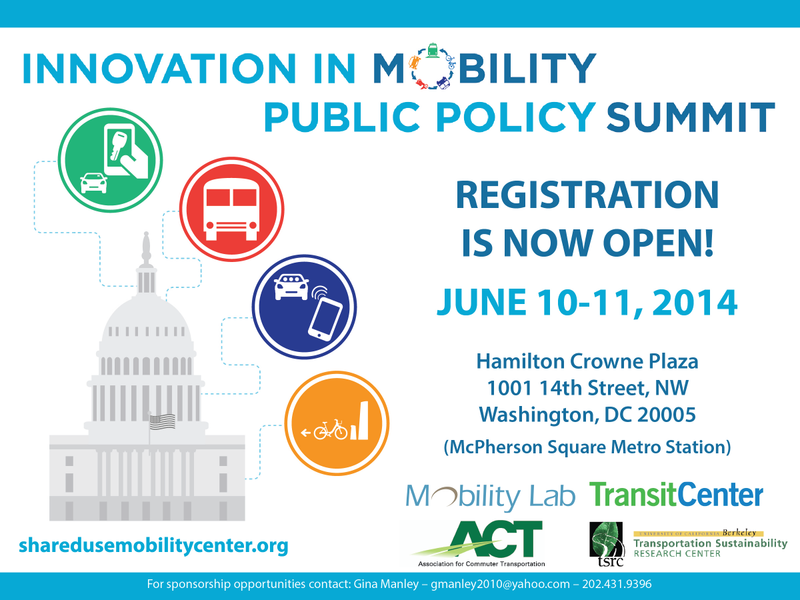 Help craft the direction of Public Policy for bike-sharing next week in the Capital City of the USA. See you in DC! Nice Ride Minnesota bike-sharing is going into the bike rental business in an upstate Minnesota summer resort town. Bemidji Nice Ride will begin renting bicycles out of four manned locations in the middle of June. There will not be self-service kiosks available as with the Nice Ride program in Minneapolis and St. Paul, Minnesota. After being one of the first cities to introduce 2nd generation bike-sharing in 1995, with Bycyklen, those odd looking, grocery trolley tethered bicycles, Copenhagen in now offering something close to 4th generation bike-sharing with an odd looking, computer tablet controlled, electric assist - pedelec- called the new Bycyklen for 2014. Although already on the streets during testing for a few months, the new program was only opened to public use this April. There has not been the fanfare of an official launch as of yet. Currently though, there are 250 gobikes in 10 stations. From the original plan, the program is scheduled to grow to around 1,250 gobikes in 65 stations. The price for casual use is 25kr (US$4.50) per hour. With the monthly subscription of 70kr (US$12.75), plus an hourly usage of only 6kr (US$1.00). There are incentives and penalties for picking up or returning the gobikes away from the designated stations. The bikes are a bit heavy, but a cool ride. Reports out of China indicate the Hangzhou now has 78,000 bicycles in its bike-share fleet. According to HangzhouTravel.com, there has been a jump of 10% in daily usage of the program. Nearly 2,000 bicycles need maintenance daily. There are many cities throughout the world that would love to have a fleet of that size! Over 3,000 bikes each month need to be completely overhauled. New maintenance procedures has brought the fleet up to a level of 97% of bicycles with a rating of road worthiness. From the Haksong Evening News, is a report that the Xin Feida bike-share program in Wuhan has not been keeping up with its fleet and stations. The news agency reports that there are many stations void of bicycles and that the 300 million yuan (US$48,000,000) investment for the program hasn't fulfilled all of its promises. Hangzhou, China has a truer count on its bike share fleet and now is considered the largest program in the world. Recent internet stories from a policy institute on the state of world bike-sharing in a "2014 Bicycle Share Fact Sheet" have been lacking in accuracy. Since January there are over 700 cities in the world with active automated bike-share programs. Italy is overtaking Spain as the country with the most bike-share cities and China, now in third place, has overtaken Germany. For a better survey of the bike-sharing world, The Bike-sharing World Map keeps in its legend a running total of the number of cities with automated bike-sharing. Keep in touch with The Bike-sharing World with The Bike-sharing World Map. It is the premiere resource for information on cities with bike-sharing programs and the complement to The Bike-sharing Blog. The easy web address for viewing the map is www.bikesharingworld.com.